Which areas are most profitable? Who should you hire to help you? This eBook: The 3 Key Elements to a Successful Real Estate Investment, provides expert insight into everything from the benefits to utilizing hard money lending in your investment to the common mistakes to avoid along the way. 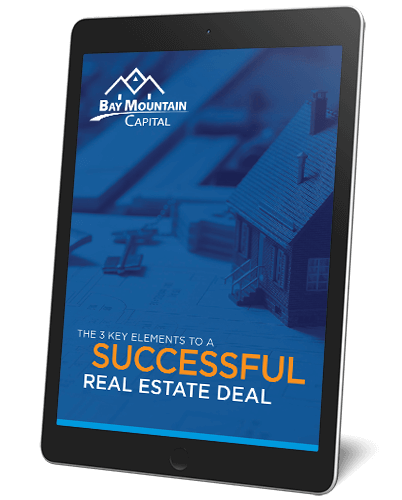 Download this free eBook today and learn the best ways to execute your next real estate deal. Please complete the form below to download our free eBook. Bay Mountain Capital has been in business for more than a decade, closing approximately 2,000 loans over that time period. We specialize in financing all types of residential and commercial property investments throughout Texas. Using a common sense and value added approach, we strive to incorporate these principles into our underwriting and closing processes. As a direct lender, Bay Mountain Capital can close a loan within one day after receiving clear title and a complete file. The process generally takes from two to three weeks, but can be accelerated where circumstances require it. We are an asset-based lender, which means that qualification requirements are limited. Our rates and fees are among the lowest in the industry.